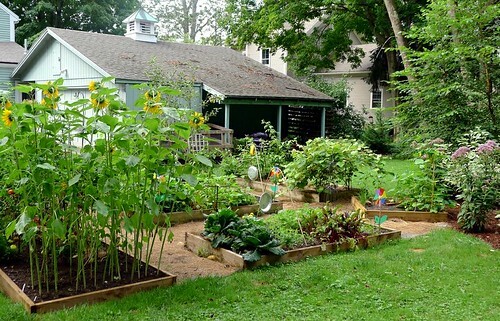 The green, green grass of home has never been greener, especially in the month of April when communities, organizations and individuals across the nation rally together to celebrate National Garden Month. According to the National Garden Association, Americans consistently rank gardening as one of their favorite, all-time hobbies. And that’s great news, because the health benefits of gardening are plentiful and well documented. Let’s take a look at just a few. Forget about going to the gym anymore! Did you know that digging in the garden for just an hour burns an average of 372 calories? Reaching to pull weeds, bending to plant flowers, lifting a bag of mulch, extending a rake, pushing a wheel barrel — gardening involves using all your major muscle groups to perform maneuvers that are similar to those you do in the gym, such as stretching, weight lifting and aerobics. Working in the garden on a regular basis will help you increase flexibility, strengthen your joints, burn off calories and best of all, lose weight. Literally meaning porous bone, osteoporosis is a disease that weakens your bones, placing you at a higher risk for fractures. Although men can get it too, osteoporosis most commonly affects post-menopausal women and can be prevented by eating healthy and staying physically active. That’s where gardening comes in. Research conducted by the University of Arkansas found that women 50 years and older who gardened at least once a week had stronger bones than those who were inactive or performed other types of exercises, such as walking, jogging or swimming. Study results concluded that only two activities — weight lifting and yard work — were strongly associated with higher bone density and a lower risk of osteoporosis. Getting in touch with nature has significant restorative benefits, most importantly, stress relief. A 2011 study published in the Journal of Health Psychology found that subjects who were assigned to outdoor gardening had a greater reduction in the stress hormone cortisol and experienced a more positive mood than those who were assigned to indoor reading. Additionally, a Swedish study found that having access to a garden in the workplace had a positive impact on stress and comfort. With the increase of stress-related illnesses, donning gloves and a wide-brimmed hat may be just what the doctor ordered to reduce the stress in your life. Lightweight and portable with a single battery that lasts over 4 hours, the Inogen One makes it easier than ever to spend time outdoors reaping the many rewards of gardening. Whether you want to pay a friendly visit to your local Farmer’s Market, plant an herb garden in your own backyard to promote wellness and healing, join a community garden project or sit quietly amidst an abundance of lettuce and arugula, the Inogen One is right there with you as it allows you the freedom and independence to enjoy life, each and every day, to the fullest. If gardening sounds like something you’d enjoy, grab your Inogen One and head over to the nearest dirt patch. Getting your hands dirty will never be more enjoyable.